Ministry of War. 41* November, 1919. 1. The non-Moslem elements have not voted at the elections; the different political parties also show a reserved and waiting attitude. The various political parties justify their reserve by saying that there are two governments in the country and that the elections were not conducted with the necessary impartiality. In addition, it is very probable that the Christian elements will put forward the same claim themselves as a reason for not having voted. The complaints and grievances about irregularities occurring during the elections are accumulating and find an echo in foreign circles and newspapers. If the Chamber of Deputies is not representative of the different parties and, specially, if it should be formed under pressure from the national forces, it is unnecessary to say what the world will think about it. For this reason it is imperatively necessary to avoid any kind of pressure during the elections. 2. Based on numerous doubts of a home and foreign description to which the meeting of the deputies at any other place than the metropolis would give rise, it is of vital interest to the country that the Assembly should meet in Stambul. 3. From news which is constantly reaching us, it becomes evident that certain people in the provinces, appearing on behalf of the na tional organisations, interfere in the affairs of the Government. It is necessary and of the greatest importance that an end should promptly be put to this interference. Kemal Pasha J 6 I will give you the literal wording of my reply to this telegram, in which I observed in a note at the beginning that it was to be de ciphered by Salih Bey, the senior A. D. C.
In cipher. Sivas, 5 th November, 1919. To His Excellency Djemal Pasha, Minister of War. Reply to your telegram of 4 th November, 1919. 1. There is surely no ground for attributing the abstention from the elections of the non-Moslem elements and of certain political parties that are doing more harm to the country even than these elements to motives which they themselves prominently display with intention. Is it not well known that the Christian elements declared that they would not vote at the elections, even long before the national organisation existed and before its name was ever mentioned? As for the political parties that make such a fuss, everything they say is deliberately false, because, as a matter of fact, they have voted everywhere at the elections. 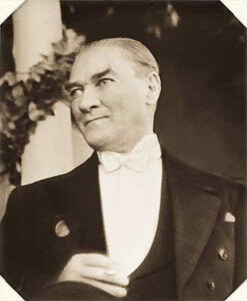 But as these parties have no more than five or ten followers, the nation has no confidence whatever in them, and as the nation is determined this time to elect deputies from its own sons and not from the candidates in Constantinople, the parties in question are only upset because they know that they have not the faintest chance of succeeding. What can we do abdut it ? We are aston ished at the undecidedness of the Cabinet. Wheye is the pressure that you speak of exercised? by whom? under what fcircumstances? You must be good enough to give us precise facts on these points, so that the Representative Committee will be in the position to do their duty. No importance need be attached to these fairy tales, nor need they cause you the slightest anxiety. 2. Time will show whether the Government have been right or wrong in their views concerning the convention. We have told you that we will inform you of our conclusions on this question after we have received replies from our committees. In the name of the Representative Committee. The Minister of the Interior decided to send several Commissions into the country. One of them, with Ahmed Fewsi Pasha, the former Under Secretary of State in the Ministry of War, at the head of it, consisted of Ilshami Bey, member of the Court of Appeal, and Hassan Effendi, the Fetwa Emini. The reasons that had necessitated Fuad Pasha remaining at the head of his Army Corps at Angora gradually became apparent. The chief reason was that they had begun in the interior of the country to poison the minds of the people.